For all of the growth and improvement in businesses, residents, restaurants, and bars, Deep Ellum lacks a public gathering space. Crowdus Street is located in the heart of Deep Ellum, running cross-grain to the primary vehicular roadways, and has great potential to become a pedestrian-only thoroughfare. From ReelFX Creative Studios to Deep Ellum Brewing Company, there are eight blocks that might be redesigned to add to the vibrant future of Deep Ellum. 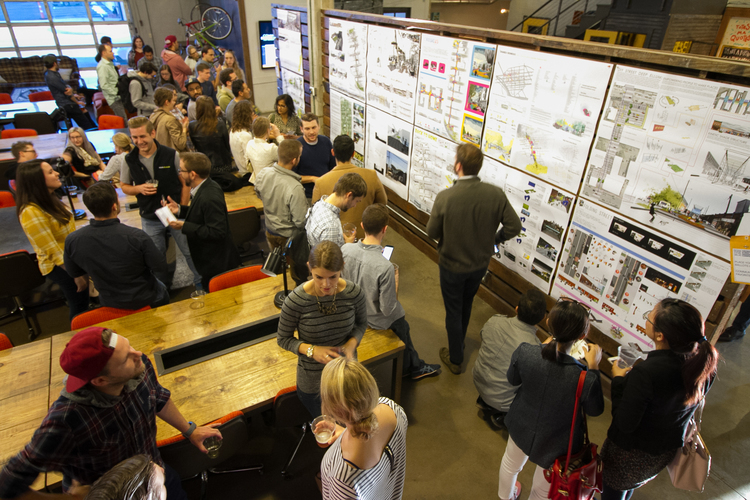 In Spring 2015, a collaborative team created a prototype of what the future of Crowdus Street could look like [photos]. Based on the success of this temporary project, we proposed an open design competition to solicit ideas for a permanent design. 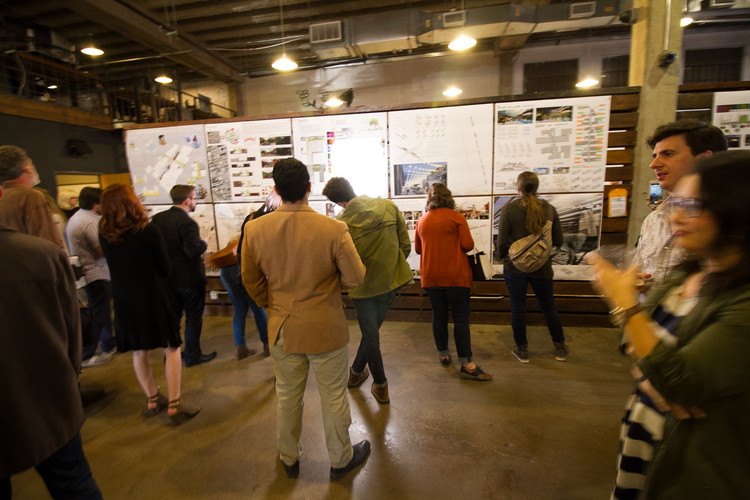 The Crowdus Street Design Competition asked teams of Designers, Artists, and Creatives to redesign Crowdus St. as a visionary project for pedestrians in the heart of Deep Ellum. In undertaking the task of hosting and facilitating the competition, certain goals came to the forefront. Preserve the cultural heritage of Deep Ellum. Protect the neighborhood’s history and authenticity, while allowing room for its identity to evolve . Create a practical framework and provide real useable space to residents & visitors. With these goals in mind, congratulations to the three winning teams of the Crowdus Street Design Competition. From the team: Sunlight glances off the sleek chrome of the enormous ring suspended above the intersection before me. As I press the crosswalk button, the cars slow to a halt, and I pass a sculpture of weathered wood posts crafted with rusted steel to support the hoop floating above. I remember the first time I visited Crowdus Park ten years earlier. In response to the revival gaining in Deep Ellum, the park was a powerful intervention that transformed the chaotic mess of traffic and insufficient pedestrian space into the local pride it is today. Originally three blocks long, it's grown organically over time, and the fused wood and steel sculptures are now faded with wear. The series of chrome rings above every intersection have maintained their sleek purity, and continue to reflect flashes of downtown, surrounding buildings, and curious crowds back at pedestrians; in contrast, the supporting beasts embody the handcrafted charm of the park's industrial character. Layers of graffiti tell the rich history of the cultures and creatives that have grown roots in the neighborhood, and the strains of a local band performing nearby infuse the air. As I walk beneath the dappled shade of trees lining the street and pass by the group of street musicians, I become an essential part of the fabric of this city and the lives present here. From the team: We are "Breaking Ground" on a new vision for Deep Ellum - one that brings together the community in a walkable, vibrant environment. 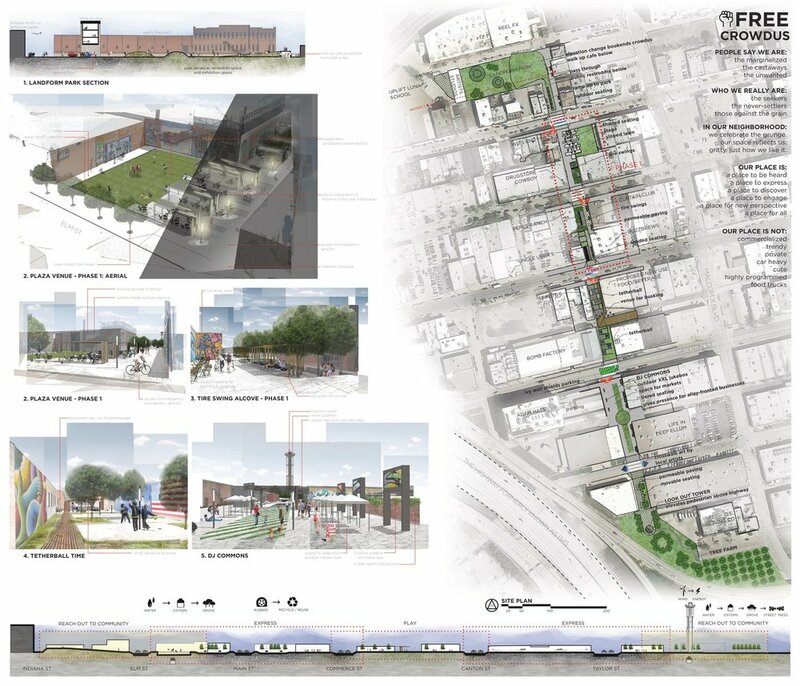 The intent is to create a linear park that is well integrated in the historic industrial framework, respecting Deep Ellum's past while providing an exciting new destination and greater connectivity to the broader city. People are now the priority. The Ground that was once focused on cars can now be used for a variety of pedestrian activities and community events. 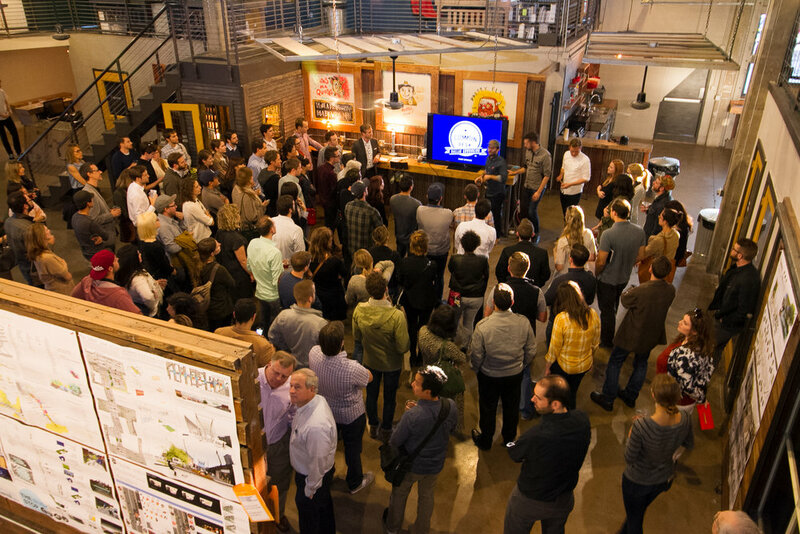 Adjacent businesses can spill out to energize the space. Underutilized areas such as alleys and parking lots are activated and incorporated to firmly root our design into the Deep Ellum neighborhood. Native vegetation and innovative stormwater solutions improve the urban ecosystem and offer a much needed reprieve from the harsh urban environment. This transformed street will serve as a catalyst for the rest of Deep Ellum, encouraging more ground to be broken where the community can take root and grow. From the team: When you turn the corner from a noisy vehicular roadway, there is a secret garden in the front of you- Crowdus Street Corridor. A sea of sphere lighting forms an intricate canopy, it leads you to a mysterious space. A landscape rail with movable containers in the middle of the corridor from Indiana Street all the way to Malcom X Boulevad. The container is a Pandora's Box- it can be opened as passionate as a live stage or as calm as a gallery; it can be opened.in the day time as a cafe or night time as a bar. When you get tired, you can relax on the bench. The bench with vegetation has an endless combination of methods and fresh with possibilities. The facade on both sides of the corridor display jazz and blues musicians' class moments. It's like a black and white movie which recalls the history of Deep Ellum. Thousands of colorful musical notes on the mural wall compose new music for the future of this area. When you are rambling on the Crowdus Street Corridor, how far would you get to the place where you can't remember, and you can't forget? Deep Ellum developed in the late 1800s as a residential and commercial neighborhood on the east side of Downtown Dallas. The early 1900s flourished with industrial development, serving factory facilities for the Continental Gin Company and Henry Ford’s Model T. Deep Ellum’s real claim to fame was found in its music. By the 1920s, the neighborhood had become a hotbed for early jazz and blues musicians, hosting the likes of Blind Lemon Jefferson, Huddie “Leadbelly” Ledbetter, Texas Bill Day and Bessie Smith. Following WWII, the success of Deep Ellum started to fade. The ever-growing availability and use of the automobile led to the removal of the Houston and Texas Central railroad tracks -- to make way for the Central Expressway-- and by 1956 the streetcar line had been removed. Businesses closed and residents moved, and in 1969 a new elevation of Central Expressway truncated Deep Ellum, completely obliterating the 2400 block of Elm Street. Today, the neighborhood is on the upswing in a state of transition. Large scale residential and multifamily construction, streetscape improvements, and a large commission of mural artwork is contributing to Deep Ellum’s growth as a cultural center in the City of Dallas. For all of the growth and improvement in businesses, residents, restaurants, and bars, Deep Ellum lacks a public gathering space. Crowdus Street is located in the heart of Deep Ellum, running cross-grain to the primary vehicular roadways, and has great potential to become a pedestrian-only thoroughfare. From ReelFX Creative Studios to Deep Ellum Brewing Company, there are eight blocks that might be redesigned to add to the vibrant future of Deep Ellum. 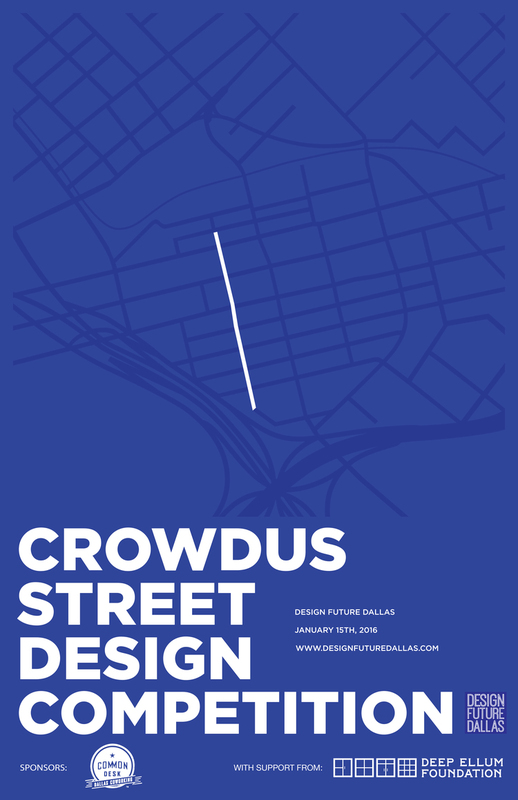 The Crowdus St. Design Competition asks teams of Designers, Artists, and Creatives to redesign Crowdus St. as a visionary project for pedestrians in the heart of Deep Ellum. There is a $1000 cash prize for the winning team and the potential to move on to further stages of design development. Teams wishing to submit an entry will pay a $35 entry fee upon submission via PayPal. More information on how to submit will follow. 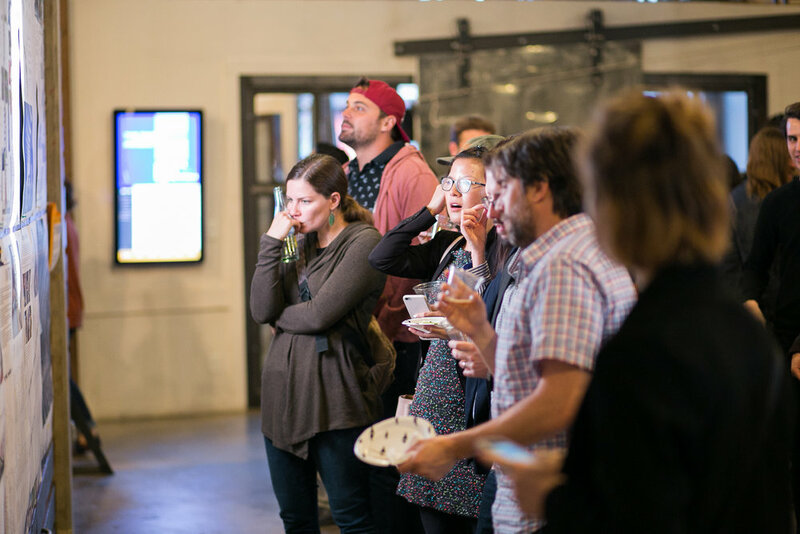 The announcement party will be held on March, 24th, 2016 from 6-8pm at Common Desk in Deep Ellum to announce the winner of the competition. 2919 Commerce Street, Dallas.